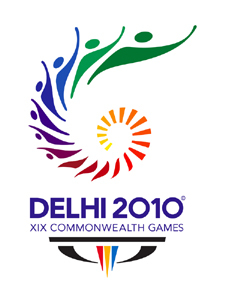 Latest News - Commonwealth Games 2010 Delhi and New Delhi. New Delhi: India on Sunday put behind a nightmarish build-up of scandals, filth and dirt and missed deadlines to come up with a dazzling and vibrant opening ceremony for the Commonwealth Games - the country's biggest sporting spectacle - watched live by a global audience of around three billion. A successful Commonwealth Games will provide India the foundation to think about a future Olympic bid, International Olympic Committee (IOC) President Jacques Rogge said on Sunday. In the Indian capital for the opening ceremony of the Commonwealth Games later on Sunday, Rogge told Times Now news channel he expected the multi-sport gathering to be a success. "I think everything will be fine. Of course you can only judge the organisation at the moment of the closing ceremony but I think it's going well," the Belgian said. "There is still a difference between Olympic Games and Commonwealth Games. The size of the Olympic Games is bigger, there are more athletes and more sports. "It's more complicated organisation but I think if the Commonwealth Games are a success, which I believe they would be, it's a very good foundation stone to think about the possible conduct of the traditional (Olympic) Games." The Delhi Commonwealth Games have been hit by one setback after another. Corruption, mismanagement, hygiene and security issues tainted the build-up to the Games but Rogge said they would still be considered a success if the athletes were happy. "The most important people in these Games are the athletes, they must be happy. If at the end of the Games the athletes are happy, that will be a success," he said. 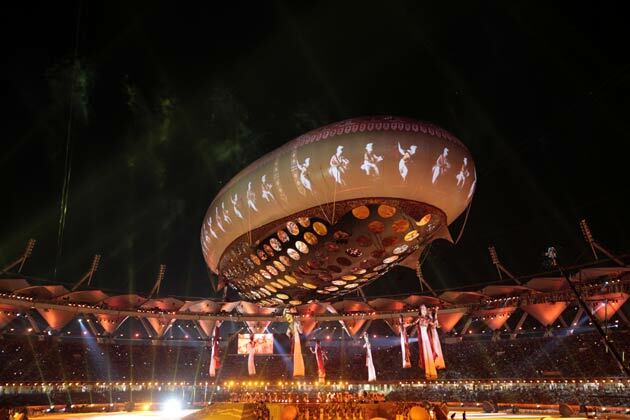 Against the backdrop of an early October sun set, the spanking new Jawahar Lal Nehru Stadium turned into a golden hue as the Rs 44 crore aerostat lifted into the skies and a bevy of puppets danced and over 800 drummers heralded the event. A spectacular laser fireworks show lit up the evening sky and India took a giant leap, 28 years after it hosted the Asian Games. In a neat diplomatic compromise, Prince Charles, representing Queen Elizabeth, the head of the Commonwealth, and President Pratibha Patil did the honours at the inaugural ceremony, amid thunderous cheers from the capacity 60,000 crowd. "I have much pleasure in declaring the 19th Commonwealth Games open", the Prince said reading out a message from the British monarch. This was followed by the address of President Patil, who concluded by saying " the 2010 Commonwealth Games in Delhi are now open. Let the Games begin", signalling the formal commencement of the sporting extravaganza. Prime Minister Manmohan Singh, his cabinet colleagues, former President APJ Abdul Kalam, Congress President Sonia Gandhi, General Secretary Rahul Gandhi, Delhi Chief Minister Sheila Dikshit, Maldives President Mohammed Nashid, Prince of Monaco Albert II, Commonwealth Games Federation President Mike Fennell, Organising Committee Chairman Suresh Kalmadi and a host of dignitaries were present at the ceremony. It was a mix of both cheers and jeers for Kalmadi when he made his speech while references to Dikshit were received by loud cheers in the audience. The past few weeks of negative publicity that had dogged the nearly Rs 70,000 crore mega-event was quickly forgotten as the glittering opening ceremony, which encapsulated a fascinating mix of culture and modernity, kept the spectators enthralled for more than two hours. The ceremony, which set the stage for 12 days of intense competition will see over 7000 athletes from 71 countries vying for honours. The aerostat, a giant helium balloon was dramatically lifted to its full height amid the sounds of Nagada drums. A spectacular display of drummers from various parts of India then took centrestage and Keshav, a child prodigy from Auroville, Puducherry, was the cynosure of all eyes. The musical production of Swagatam, a rendition of a blend of Hindustani and Carnatic that finally climaxed into a Quawalli, was performed by Hariharan. 1050 school children performed a choreography of the Namaste sign, which presented the 23 officially recognised languages of India through projections on the aerostat. The athletes parade began in which 71 women, dressed in sarees that not only represents different designs form the various Indian corners but also myriad patterns, colours and styles, carried their country's placards. The 619-member strong Indian contingent, which had Olympic gold medallist shooter Abhinav Bindra as the flag-bearer, drew the loudest cheers as it walked into the jam-packed stadium in the presence of a host of dignitaries, International Olympic Committee and CGF officials. The Pakistani contingent drew a heavy round of applause from the crowd, notwithstanding the irritants in the bilateral ties. After brief speeches by Commonwealth Games Federation chief Mike Fennell and Organising Committee Chairman Suresh Kalmadi, the Queen's Baton, which traversed through all the 71 Commonwealth nations made a grand entry with Bindra being given the honour. Badminton star Saina Nehwal, Beijing Olympic Games bronze medallist boxer Vijender Singh and wrestler Sushil Kumar were the others who carried the baton. It was followed by the arrival of the Games flags of all the participating countries and the oath-taking ceremony by the Indian captain Bindra. There was also a section dedicated to the great tradition of learning which unfolded under the Knowledge Tree - a sacred space of Learning - presenting the Indian Classical dance and music that have been passed on through the Guru shishya Parampara. The production comprised six classical dances of India, including Odissi from Orissa, Bharatnatyam from Tamil Nadu, Kathak from North India, Manipuri from Manipur, Mohiniattam from Kerala and Kuchipudi from Andhra Pradesh. Each classical dance represented a season - Odissi (Spring), Bharatnatyam (Summer), Kathak (Monsoon), Manipuri (Autumn), Mohiniattam (Fall), Kuchipudi (Winter). Through dance, music and projections on the aerostat of tree leaves, the production captured the emotions as experienced through changing seasons. India's Yogic way of life was also on display with a presentation of the practice of YOGA - the ultimate union of the body, mind and soul. 816 performers together performed a choreography that formed the shape of a sun doing the Suryanmaskar - a series of Yoga postures done in salutation to the sun. Performers on the center stage also displayed some of the most complicated asanas. The performers then dramatically changed the choreography and began to spiral, representing the kundalini - the coiled energy, an instinctive force that lies at the base of the spine. Then there was the Great Indian Journey, where a train made a grand arrival as the Cheraw dancers from Mizoram did the Bamboo dance to give the Rhythm for the train. There was also a segment on Mahatma Gandhi, where the Father of nation was paid rich tribute through a simplistic, humanistic form, depicted through sand animation based on the historic moment of the Dandi March with Mahatma's favourite hymn - Vaishnavo Janato played at the background. Folk dancers from various corners of the country also came together to rejoice and dance in celebration of the message of the Mahatma, showcasing the ultimate richness in India's folk culture.